(L-R) Robert Underwood, president of the University of Guam talks with Chancellor Straney and keynote speaker Ricardo Fernandez, president of Lehman College, City University of New York. At right is an unidentified conference attendee. Chancellor Straney receives a gift from President Underwood. The gift is in the shape of a latte stone, the Chamorro stone megaliths that served as house supports in ancient times and that today represents the survival, strength, and resiliency of the Chamorro culture. The University of Guam recently hosted a Presidential Forum for presidents and chancellors from Asia, the U.S. mainland, Hawai‘i, the Virgin Islands and the South Pacific. Donald Straney, chancellor at the University of Hawai‘i at Hilo, attended the forum and was on a panel discussing the role of universities as agents of political and social change. Straney says good examples of similar challenges are environmental issues and sustainable energy use. The Virgin Islands has started a new sustainable energy program, he says. 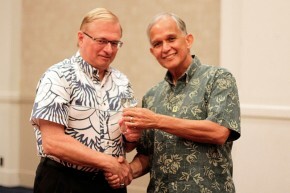 The forum was hosted by Robert Underwood, president of the University of Guam. In addition to Chancellor Straney, panel participants included David Hall, president of the University of the Virgin Islands; Reynaldo Vea, president of Mapua Institute of Technology; Ganesh Chand, president of Fiji National University; Mary Okada, president of Guam Community College and president of the Pacific Postsecondary Education Council; and Alfred Pascual, vice chancellor at the University of the Philippines. Keynote speaker was Ricardo Fernández, president of Lehman College, the City University of New York. 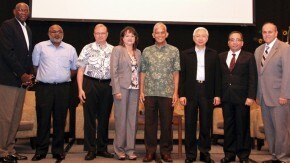 Forum attendees (L-R) David Hall, president of the University of the Virgin Islands; Ganesh Chand, president of Fiji National University; Donald Straney, chancellor of UH Hilo; Straney; Mary Okada, president of Guam Community College; Robert Underwood, president of the University of Guam; Alfred Pascual, vice chancellor at the University of the Philippines; Reynaldo Vea, president of Mapua Institute of Technology; and keynote speaker Ricardo Fernández, president of Lehman College, the City University of New York. Chancellor Straney gives President Underwood high marks for hosting the forum and starting the dialogue. “It was great that President Underwood got us all together,” says Straney. Daniel Brown, UH Hilo’s interim vice chancellor for research and economic development, arrived in Guam a couple of days ahead of Chancellor Straney and attended the University of Guam’s Founder’s Day Recognition Ceremony. Brown also attended a formal Founder’s Day Gala where officials and others enjoyed dinner and entertainment. 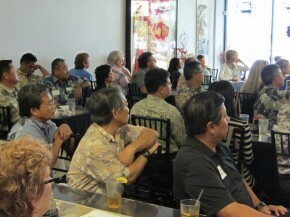 Guam’s governor, lieutenant governor, speaker of the house, and many other dignitaries were present. The following day, the group was given a tour of the island, which included much historical background. Chancellor Straney arrived that evening and attended a dinner honoring the 60th anniversary of the University of Guam. Chancellor Straney speaks during his panel. From left is panel moderator Anita Borja Enriquez, University of Guam Dean of the School of Business and Public Administration, and David Hall, president of the University of the Virgin Islands. 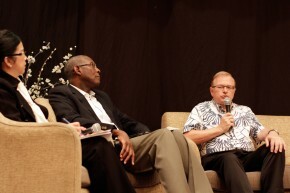 The Presidential Forum was held on July 2. Panel discussions covered the changes in higher education over the past 60 years, current changes in higher education and how universities are adapting to those changes, and the role of universities in the economic, cultural, and political aspects of their regions. In Chancellor Straney’s panel, he discussed the role of a university on an island and UH Hilo’s responsibility to improve the quality of life of the people of Hawai‘i, the Pacific region, and the world. 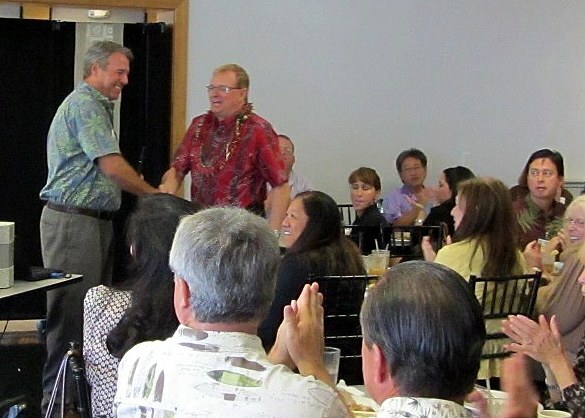 Within the context of regional issues, Straney said UH Hilo is actively engaged in projects such as the Micronesia and American Samoa Student Internship Program, UH Hilo’s Pacific Aquaculture and Coastal Resource Center, and the U.S. Department of Agriculture’s Pacific Basin Agricultural Research Center. 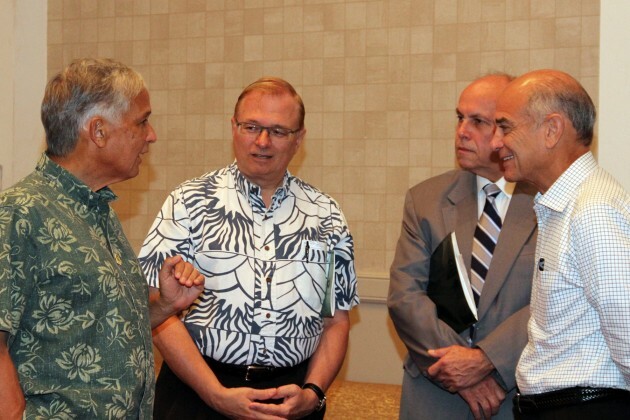 Also discussed was the Pacific Island Climate Science Center, which is a project of the United States Department of the Interior established in 2011, hosted by the University of Hawai‘i at Hilo with UH Mānoa in Honolulu and the University of Guam as a consortium. After the forum, Chancellor Straney and Vice Chancellor Brown were given a campus tour by a University of Guam professor who serves as the Guam campus coordinator for the Islands of Opportunity Alliance, a program funded by the National Science Foundation and led by UH Hilo. “UH Hilo and the University of Guam have joint research and education programs underway and I’d like to build on that,” says Chancellor Straney. Photos courtesy of the University of Guam. Chancellor Don Straney (at left) with the UH Hilo Graphics Team (l-r) Susan Yugawa, Tanya Ibarra, and Darin Igawa. 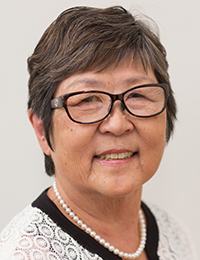 Please join me in congratulating Susan Yugawa and her Graphics Team for receiving two awards from the APEX Awards for Publication Excellence. The APEX Awards for Publication Excellence is an annual competition for publishers, editors, writers and designers who create print, Web, electronic and social media. 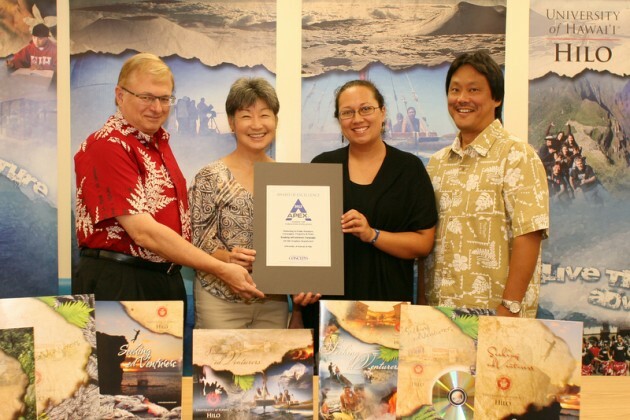 UH Hilo’s two awards were for the “Seeking edVenturers” campaign and the UH Hilo Viewbook. The edVentures campaign included the Viewbook as well as five additional publications which embodied the look, message and overall feel of the campaign. These included three additional brochures, the Catalog cover and the acceptance packet. The UH Hilo Viewbook is a 20-page publication created by Susan to be the signature piece of the “Seeking edVenturers” recruitment campaign. Susan created this piece from scratch, a new look and image that incorporates many aspects of the strategic plan into a visually stimulating publication. All of the Admissions recruitment material had to be re-created and launched in 2011, which required a significant amount of time, energy and dedication to overhauling and redesigning all of UH Hilo’s recruitment material. This accomplishment is particularly noteworthy since it recognizes the work of our in-house Graphics Department by experts in the fields of marketing and communication. The UH Hilo graphics department, led by Susan, includes Darin Igawa, Tanya Ibarra, Kelcie Valbuena and Erynn Tanimoto.